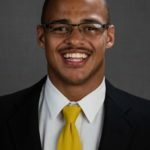 Iowa junior tight end Noah Fant has been named a Walter Camp Award player to watch. The announcement was made Friday by the Walter Camp Football Foundation. Fant joins 49 others on the watch list vying for college football’s fourth-oldest individual accolade, which is given to the nation’s best player. Ten semifinalists will be announced in mid-November and the winner will be announced live on ESPN on Thursday, Dec. 6. The trophy will be presented at the Foundation’s annual awards banquet on Jan. 12, 2019, in New Haven, Connecticut. Earlier this summer, the Omaha, Nebraska, native was named to the Athlon Sports All-Big Ten preseason and first team All-American team, and Sporting News preseason first team All-American. In addition, Fant was named to the Big Ten’s preseason honors list and John Mackey Award preseason watch list.